Lets you shift oil flow from one application to another while at full pressure. Ideal for dump trucks with pup trailers. Rated at maximum 3000 PSI. 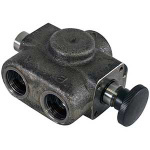 The Two Position Selector Valve from Buyers Products lets you switch the flow from one application to another while under full line pressure. It's ideal for dump trucks that pull separate pup trailers. The valve operates with the press of a knob, which diverts pressure away from the seal, allowing the spool to be shifted. It is rated at a maximum 3000 PSI.